From: Medals of the U.S. Mint, the first century, 1792-1892, by R.W. Julian. The Field medal is singular in nature because it was awarded twice, something a little out of the ordinary for Congressional medals. Perhaps the intrepid Field, for all the troubles he had gone through from the elements and business rivals, deserved more than one medal. Although Bruff produced a fairly detailed drawing for his design, William Barber, then an assistant engraver, asked for a sitting with Field in New York so that the likeness might be as perfect as possible. In September, 1867, Barber went to New York and carefully sketched Field. Barber returned quickly to the mint and began work on the proper models. After Barber's return matters moved with due artistic speed - that is to say, slow. The models were reduced on the newly-arrive Hill Engraving Machine, which had just been purchased from an English firm. This was appropriate, as Field's cable linked Great Britain and the United States. 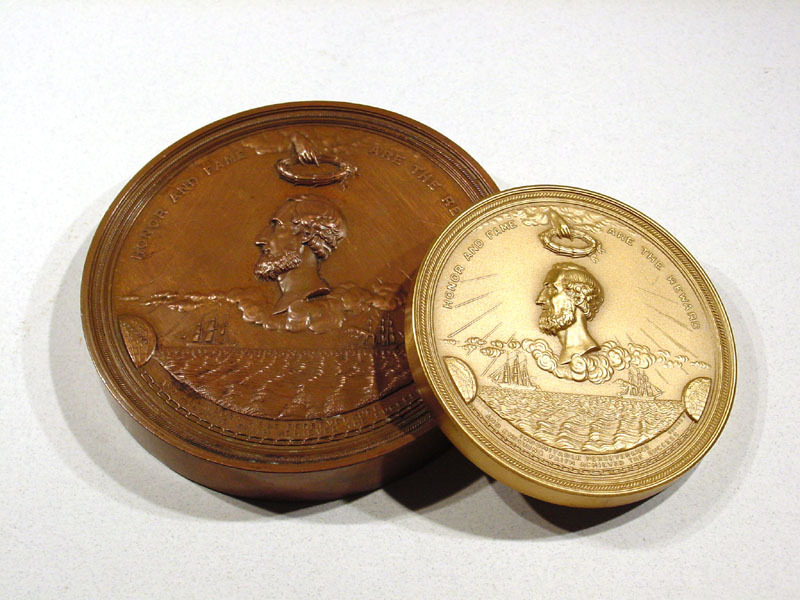 The dies were finished by late in April, 1868, and the first gold medal struck about two weeks later, after all the lengthy preparations had been made. There was some delay also with respect to a proper case. 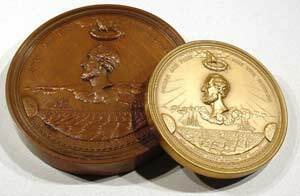 On May 15th, 1868, the gold medal was sent to the Treasury and received the next day by Treasury Secretary Hugh McCulloch. J.J. Knox, the Comptroller of the Treasury and a numismatist in his own right, wrote the mint officials that "a slight defect on the knuckle of the forefinger of the hand holding the wreath" had been found and needed correction. For some unknown reason the medal was then put in an obscure Treasury Department safe and forgotten. 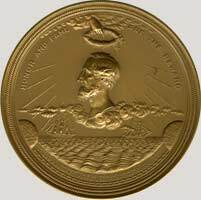 By late in 1868 Field had begun to wonder where his medal was and said as much to those in a position to find out the reason for the delay. The Treasury officials could not find the first medal and ordered another one struck. This was sent to Washington on December 17th, 1868, and duly presented to Field. The first gold medal seemed to have vanished. Suddenly, in late March or early April, 1874, someone found the first gold medal and sent it to Philadelphia for melting. Field received news of his first medal being found, probably through the newspapers, and asked to have it also. After a jeweler tested the first piece to make sure it was pure gold, Field paid the government its gold value and received the first gold medal. The value of the fine gold in the first one was $553.90 (26.79 ounces). The Field medal went on public sale about 1869 or 1870. A number of aluminum medals were struck in November, 1868, possibly in part for Field himself. Obverse: Hand issuing from clouds about to place a laurel wreath on the head of Cyrus Field (to left) itself on a base of clouds. HONOR AND FAME ARE THE REWARD above a scene of ships sailing from two partial globes labelled AMERICA and EUROPE; the two continents are further connected by a chain at the bottom. Exergual legend INDOMITABLE PERSEVERANCE AND ENDURING FAITH ACHIEVED THE SUCCESS. In small letters towards bottom J.G. BRUFF.D. and BARBER F. The whole is surrounded by a border in the form of a cable. Reverse: Ornate border, American shield, thirty-one stars in the form of a star, branches, and a globe labelled EUROPE and AMERICA within and around the legend BY RESOLUTION OF THE CONGRESS OF THE UNITED STATES above inscription MARCH 2, 1867, TO CYRUS W. FIELD OF NEW YORK FOR HIS FORESIGHT, FAITH AND PERSISTENCY IN ESTABLISHING TELEGRAPHIC COMMUNICATION BY MEANS OF THE ATLANTIC TELEGRAPH CONNECTING THE OLD WITH THE NEW WORLD. The images are from the bronze replica (Mint #625) issued by the United States Mint of the gold medal awarded to Cyrus Field in 1868. The original medal was 103mm in diameter; the replica is 76mm. Thanks to Rich Hartzog of World Exonumia for supplying the historical information on the medal. Click here to visit Rich's exonumia website. Randy Cole shares this photograph of his 103mm bronze replica of the Field medal, shown with the 76mm version for comparison. 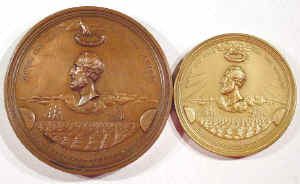 The larger medal is 14mm thick, about twice the thickness of the 76mm medal. Randy also maintains a website on the Vibroplex series of telegraph keys. 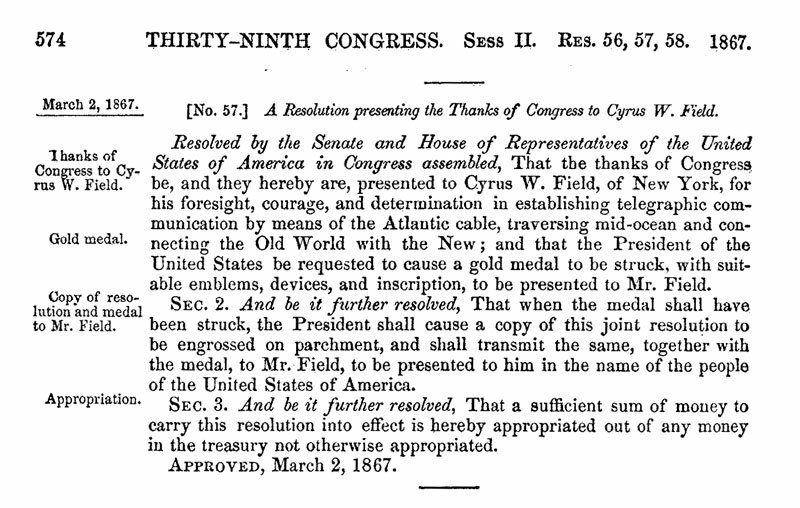 A Resolution presenting the Thanks of Congress to Cyrus W. Field. 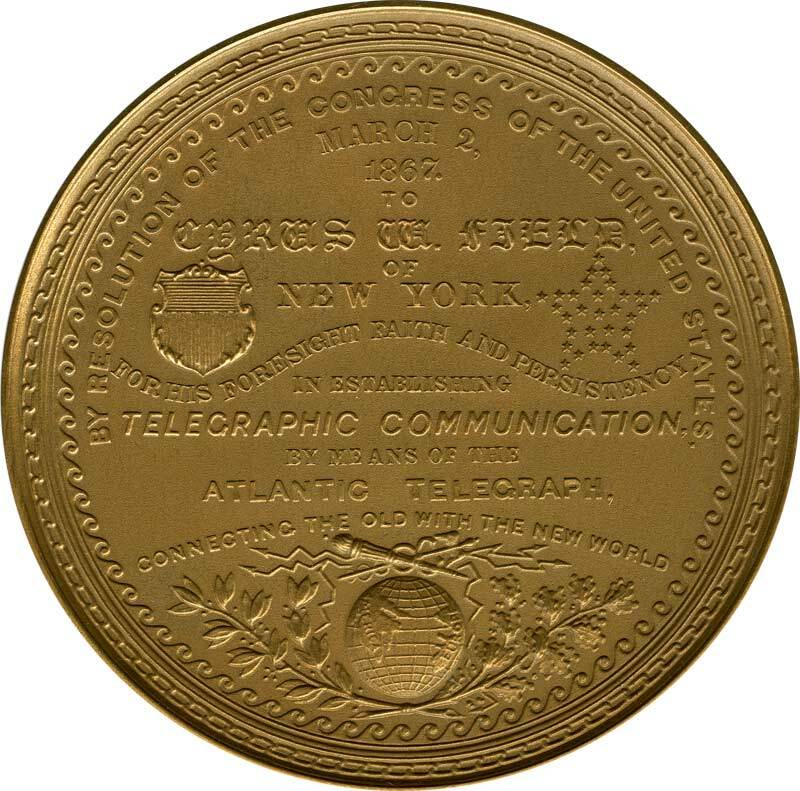 Resolved by the Senate and House of Representatives of the United States of America in Congress assembled, That the thanks of Congress be, and they hereby are, presented to Cyrus W. Field, of New York, for his foresight, courage, and determination in establishing telegraphic communication by means of the Atlantic cable, traversing mid-ocean and connecting the Old World with the New; and that the President of the United States be requested to cause a gold medal to be struck, with suitable emblems, devices, and inscription, to be presented to Mr. Field. SEC. 2. And be it further resolved, That when the medal shall have been struck, the President shall cause a copy of this joint resolution to be engrossed on parchment, and shall transmit the same, together with the medal, to Mr. Field, to be presented to him in the name of the people of the United States of America. SEC. 3. And be it further resolved, That a sufficient sum of money to carry this resolution into effect is hereby appropriated out of any money in the treasury not otherwise appropriated. The American Parliament has passed a resolution of thanks to Mr Cyrus Field, for having made the Electric Telegraph between England and the States, and has ordered a Gold medal to be struck, in honour of Mr Field’s single-handed feat. This is quite right. Punch would be the last man to deny that “alone Field did it”. We are not quite sure whether he let the water into the space called the Atlantic Ocean, but we know that he invented electricity and telegraphy, and after years of solitary experiments, perfected the Cable which is now laid. He carried it in his own one-horse gig from Greenwich to Ireland, and having previously constructed the machinery for paying it out, launched the Great Eastern by his unaided efforts, lifted the rope on board, and consigned it to the deep with his own hands. Mr Field tied on the Newfoundland end with great neatness, and then ran on with the continuation, and never sat down, nor even blew his nose, until he despatched the first message. Therefore, the medal is his, and the reverse also. But in concession to the ignorant prejudices of the world, might not just the most modest space, say the rim, bear in faint letters the names of Gisborne, Glass, Elliot, Anderson, Canning, and one or two more, who stood by, with their hands in their pockets, and saw the smart Cyrus perform the Herculean task. Anyhow, we do give the ground on which this end of the Cable rests. But we would not press the request, if it would hurt American feelings. 40th Congress, 3d Session. | House of Representatives | Ex. Doc. No. 89. GOLD MEDAL PRESENTED TO CYRUS W. FIELD. The gold medal presented to Mr. Cyrus W. Field. February 18. 1869.—Referred to the Committee on Foreign Affairs and ordered to be printed. 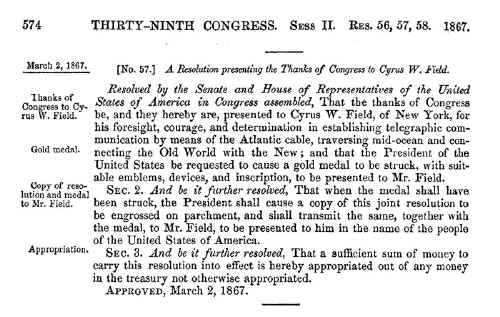 I transmit to Congress a report from the Secretary of State, with accompanying documents, in relation to the gold medal presented to Mr. Cyrus W. Field, pursuant to the resolution of Congress of March 2, 1867. The undersigned, Secretary of State, has the honor to lay before the President, with a view to its transmission to Congress, the accompanying copy of a correspondence in relation to the gold medal presented to Mr. Cyrus W. Field in the name of the people of the United States, pursuant to the resolution of Congress of March 2, 1867. Respectfully submitted. SIR: With this you will receive a letter addressed to Mr. Cyrus W. Field, which is intended to accompany a box containing a medal and a packet containing an engrossed copy of a congressional resolution, which, bearing the address of Mr. Field, have been sent to you to-day by Harnden's Express. You will take an early occasion to place the enclosed letter and its accompaniments in the hands of Mr. Field, and inform the department of their delivery. United States Despatch Agent, New York. SIR: Pursuant to the resolution of Congress of March 2, 1867, the President has caused to be prepared, for presentation to you, in the name of the people of the United States, a gold medal, with suitable devices and inscriptions, in acknowledgment of your eminent services in the establishment of telegraphic communication, by means of the Atlantic cable, between the Old World and the New. Cyrus W. Field, Esq., &c., &c., New York. New York, January 22, 1869. SIR: Your favor of the 21st was received this morning, as also the medal and roll for Mr. Field. I regret to say that Mr. Field sailed for Europe in the Cuba on Wednesday last. I have them deposited in my safe, and await your further instructions. I would suggest their deposit, until Mr. Field's return, in the "Safe Deposit Company" of this city. SIR : Your note of yesterday has been received. In reply, I have to state that no objection is perceived to your making such disposition of the medal, &c., as you propose, until the return of Mr. Field from Europe. 50 Dunne Street, New York, February 5, 1869. Request Mr. Derby to please deliver the gold medal and documents from the Secretary of State to my daughter Grace. Received from J.C. Derby, esq., the gold medal and resolutions from Congress.